Aman brings drive, determination and focus to her role at Summit Search Group. Prior to joining Summit Search Group, Aman had a successful career in the training and development industry. From there she brings a focus on client service and a keen sense of how to aid in facilitating an organization’s overall talent management goals. Aman’s dedication and commitment coupled with her strong work ethic have been influential in her success. She takes great pride in the service that she provides to clients and candidates and has a talent for naturally connecting with people. Aman thoroughly probes to understand the goals of the client and candidate, allowing her to achieve a perfect match. 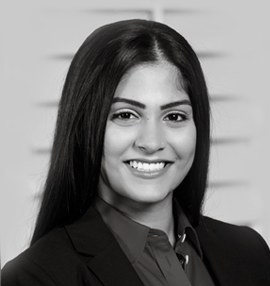 As a graduate of the York University Human Resources program and having earned a Honours Bachelor of Human Resources, Aman has undertaken and completed several strategic Human Resource courses including recruitment, organizational development and training and development. Having visited Thailand, India, Costa Rica, Italy, Switzerland to name just a few destinations. Aman is an avid learner with a strong appetite and affinity for experiencing new cultures and foods.